This winter, Freeride World Tour vice champion snowboarder Anne-Flore Marxer distributed hundreds of items of warm clothing as part of the Riders for Refugees initiative, among migrants and asylum seekers who have made it to Northern Italy. Marxer, who is from Switzerland and has made her name riding some of the world’s gnarliest lines as well as for her advocacy for gender equality, had two goals this winter season: one was to reclaim her place on the podium at the impending Freeride World Tour, and the other was to galvanise as many winter-sports brands as possible into donating warm clothing to the scores of people who have fled war, persecution and hardship and made often perilous journeys to get to Europe. The industry responded in spades, and big-hearted brands who donated gear include Volcom, Quiksilver, Billabong, Vissla, BUFF, Racer Gloves, VAUDE, Pull-in and Thermopad, as well as Culture Sud, local to Biarritz in the south of France where Marxer spends the autumn surfing as part of her pre-winter training regime. Marxer’s dedication paid off, with 164 boxes containing jackets, gloves, beanies and neck warmers ready to go by mid-December. With her friend and fellow pro-snowboarder Aline Bock, as well as support from other volunteers, the 33-year-old drove the mass of clothing to areas including Ventimiglia, which, following stricter border policies, has become a frontier of the humanitarian crisis. Once there, they distributed the clothing, bringing a smile to those who were losing hope in humanity. Marxer and Bock met people who were teachers, graduates, chefs, drivers and entrepreneurs, from countries including Afghanistan, Pakistan, Eritrea and Sudan, who were sleeping under bridges or in makeshift tents, forced into nearby forests during the day to keep warm by campfires. For skiers and snowboarders the world over, the ensuing winter chill enkindles excitement and anticipation: the promise of snow tantamount to fun and adventure. 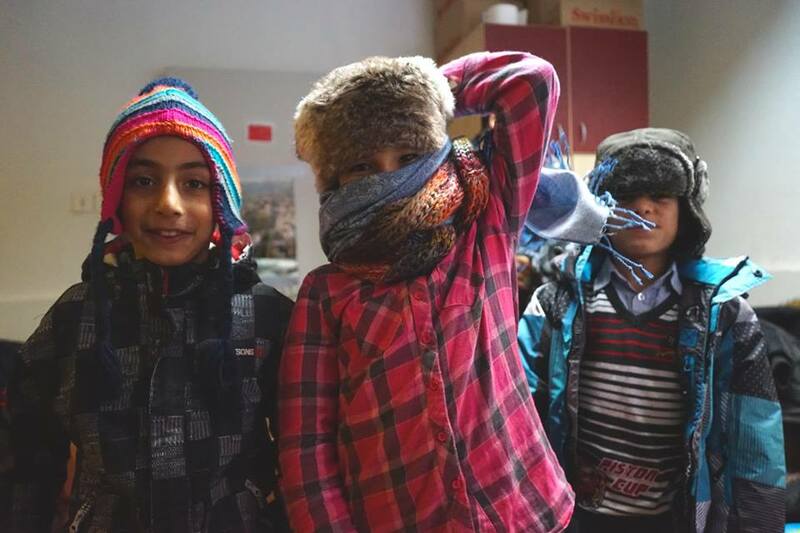 But for the tens of thousands of refugees who are forced to flee their homes because of warfare or fear of persecution, with only what they can carry and the clothes on their backs, the winter onslaught is a desperate and potentially deadly time of year. Since the closure of the Balkan corridor through Europe from Turkey by EU leaders in 2016, tens of thousands of refugees arrived on Italy’s shores this year alone, often via rickety boats from Libya, carrying predominantly displaced people from Africa, Syria, Afghanistan and Iraq. Thousands die in the attempt, while many of those who do survive the journey end up in one of scores of refugee camps across Italy and beyond and begin an indeterminate waiting game. Their plight is unimaginable for most of us who live cosy lives in the West. Their initiative grew from the simple premise that snowboarders and skiers the world over have surplus jackets lying around, which could go towards keeping some of the world’s displaced and desperate people warm. “We often feel helpless when faced with the big struggles of the world,” says 33-year-old Marxer. “But feeling helpless doesn’t change anything. When people work together they can make a difference. And it’s got to start somewhere. I know for a fact that when you’re motivated, you can achieve much greater things than you imagine. Marxer, launched her own Riders for Refugees campaign via her social media accounts. She is one of an army of volunteers from the winter sports community across Europe supporting Riders for Refugees. Marxer has long been an advocate for women in winter sports and gender equality and was integral in the fight for women’s place on the Freeride World Tour after the women’s competition was downgraded to the qualifier only tour, at a time when costs far exceeded the prize purse. Marxer became champion in 2011 and is currently vice world champion. She says she draws her inspiration from the strength shown by her grandfather, who was in a member of the French Resistance in the Second World War. “Doing this has given me a whole new perspective on life,” Marxer adds. “When you start working towards something that’s bigger than your own ego, career or hobby, the energy you find for it is incredible. It makes you a better person. “I’ve asked everyone I could think of for support and people have been so supportive. And the response I’ve had from people on social media has been incredible.